If ever you visit Bristol, there’s one location you must – assuming you’re to some degree a food lover – pop your head into; St. Nicholas Market. Chock-full of vibrant stalls and shops purveying food inspired by cuisines the world over, it truly is a feast for the senses. Inside the market building itself is a small, unassuming cafe that sells a wide range of delicious and frugal cakes; perfect inspiration for yet another flapjack recipe. 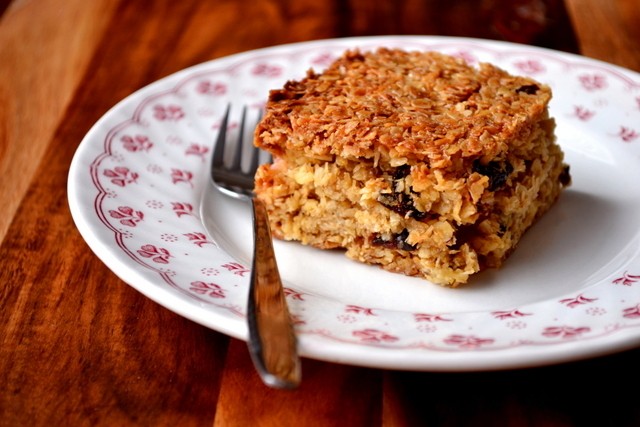 So timid is the cafe that I struggle to remember its name, perhaps it doesn’t have one, but it has given rise to this mouth-watering recipe for Coconut and Prune Flapjacks. 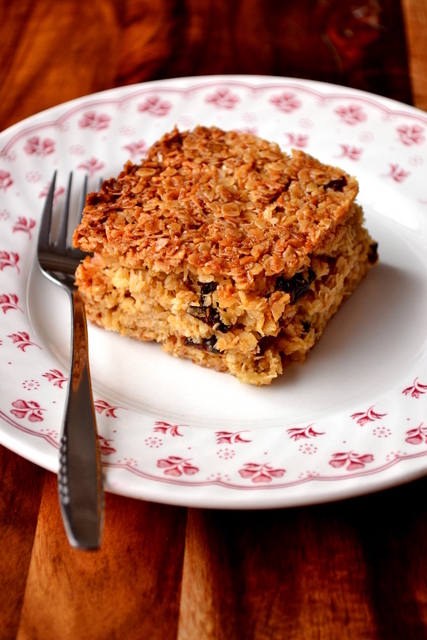 Despite the addition of desiccated coconut – which you’d expect to dry a mixture out – the recipe below yields decadently soft and chewy flapjacks, punctuated by soft and juicy prunes that have been gently warmed with butter, sugar and golden syrup. Indulge in one in the morning – perhaps alongside a frightfully strong coffee – and you’ll be kept going all day long. Though 100g of desiccated coconut may seem a lot, the flavour isn’t too overpowering, which is often the case with coconut-based food. Instead, the flavouring is fragrant and mouth-watering, drawing you back for more after every mouthful. 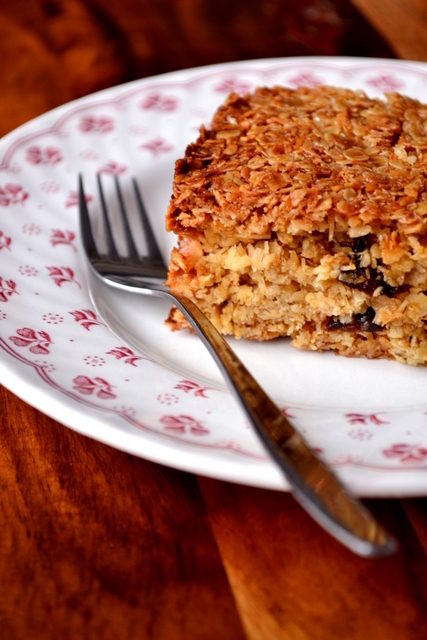 Be careful with these coconut flapjacks, they are exceedingly dangerous and should be consumed with caution. Fancy a healthy alternative? Check out my recipe for Banana Flapjacks, which contain absolutely no refined sugar and little butter. Grease and line a square cake tin roughly 30cmx30cm and preheat the oven to 190C/170C (fan). Melt together the butter, sugars, syrup and prunes in a pan. Place the oats in a large mixing bowl and tip in the melted mixture. Tip in the coconut and combine everything thoroughly before pressing firmly into the prepared tin. Bake the flapjacks for 20-25 minutes until golden brown and gently caramelised. Set aside to cool before cutting into slices or bites. For an extra dimension of flavour why not try drizzling with dark chocolate? 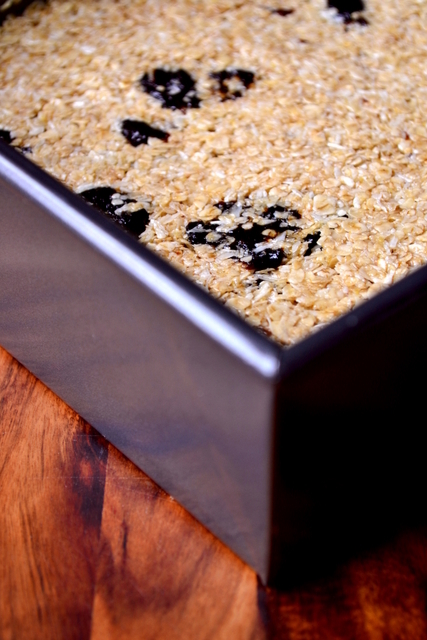 Cost: Oats are an incredibly cheap and versatile ingredient; it’s no wonder flapjacks are a go-to recipe for me. Prunes and desiccated coconut also tend toward to frugal end of the pricing scale and help to bring this recipe in at a very pleasant £3. I have been making flapjacks recently to use as cycling fuel on the 100k spins. They are perfect fuel and don’t have the downside of the gels, if you know what I mean. In between gooey and dry; a nice balance. What a great texture! I bet the flavor combination is delicious too! Thank you; yes the combination was really yummy. I had forgotten that flapjacks in the UK refers to oat/muesli bars and was curious when I saw coconut and prune in your post thinking they were pancakes (which some Americans call flapjacks) – I wonder how coconut and prune pancakes would taste like? Hmm. Here in Australia, it’s more clear cut – muesli bars and pancakes 🙂 would love some of your coconut and prune flapjacks right now though! I love prunes and these looks so yummy! 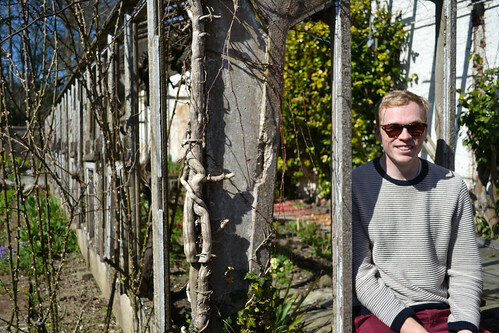 Do you think that I could substitute dates for prunes? Yes! And sorry for the late response! Dear sir or madam I made coconut and prune flapjack today let them cool down came to cut them they were breaking up looking like granola very disappointed because they tasted lovely is there anything I can do to correct the flatjack if you could let me know or anybody had the same problem.